WOW! At last a elevated dog feeder that's "made in USA", fully adjustable, high quality, sanitary, sturdy & tall enough for large breeds. Fully welded heavy steel adjustable feeder that will grow with your dog and is powder coated, guaranteed to last a lifetime! 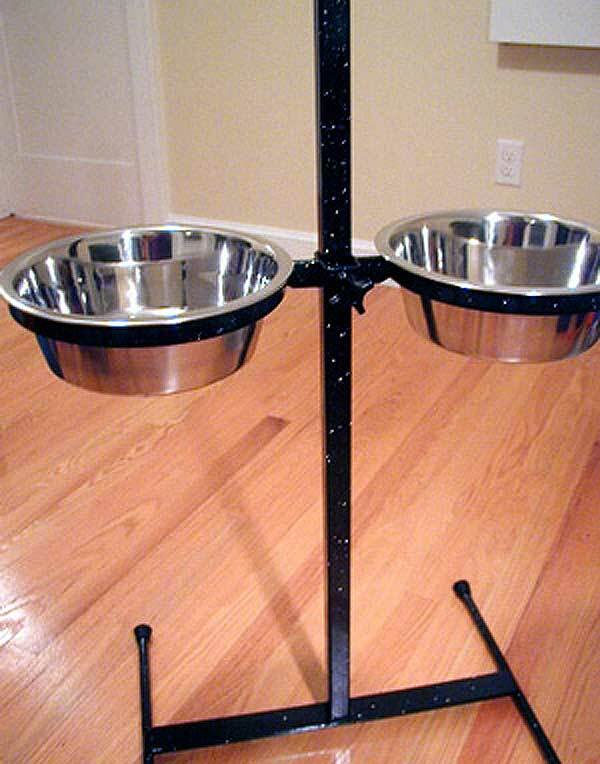 Our very first elevated dog feeder was sold in 2005 and it is still in use today! That's 11 years of service and still going strong! Questions about our elevated dog feeder or custom options? Visit our Contact Page located in the top navigation menu and send us an email or call (508) 538-1150 any time. Would you like to read customer reviews or additional feeder specifications? Jump back to our Large Breed Dog Gear page for more info by following your breadcrumb trail in the blue header below, or use your browser's "Back" button. Go straight to jZ Canine Storefront to purchase a double, triple, or slow feed elevated dog feeder. Elevated Dog Feeder Order Form - Enter options in fields provided & view "total" for pricing. *A $30.00 shipping surcharge APPLIES TO TRIPLE 5-QUART feeders due to OVER SIZED box. STANDARD COLOR is BLACK powder coat and you may choose this below. You may also choose an (optional) custom color below. You may bling your elevated dog feeder here, add silver or gold glitter clear powder top coat below. Hawaii, Puerto Rico, Canada, Mexico and International Orders Only. Please choose appropriate shipping here. * We DO NOT collect VAT or Import taxes that may be due to your Country when receiving goods from the USA. Don't see the options you want here on all-about-Great-Danes.com? Try our jZ Canine Store to purchase double, triple, or slow feed elevated dog feeders.